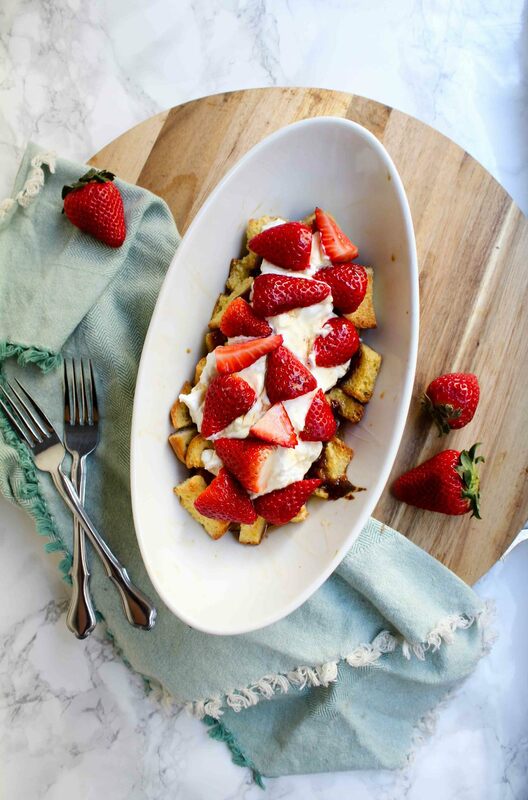 This gluten free breakfast for two features moist and yummy sourdough, fresh strawberries, tangy Greek yogurt, and a few drizzles of either maple syrup or honey. It's sweet, satisfying, super simple to whip up, and the perfect addition to a slow, relaxed Sunday morning. Cut bread into 1" cubes, then whisk eggs, milk, vanilla extract, and lemon zest together in a small bowl. Dredge bread in egg mixture, then transfer to an oven-safe baking dish. Add strawberry jam to the dish in dollops, then bake for 25 minutes, or until the egg mixture has set and the bread becomes golden in color. Remove from oven and top with Greek yogurt, sliced strawberries, maple syrup and/or honey.